Ripple Star, a planet that's populated by fairies, is being invaded and conquered by a threat called a Dark Matter. Ribbon, one of the fairies living in the planet, flees from home with their sacred treasure, a giant crystal, but then in their pursuit, the Dark Matter shatters the crystal into pieces throughout the galaxy and Ribbon falls onto Pop Star... Heartbroken to find that she is left with only one of the shards from the giant crystal, Ribbon also meets Kirby, and as she explains her situation to it, Kirby agrees to retrieve all of the crystal shards and save Ripple Star from the Dark Matter's control. The story is good for a kirby title, it’s just a simple and straightforward plot that kirby games are known for, so I'm not expecting deep and complex stories from them, but its appropriate for this certain title since it's cutesy and charming, I did however find it interesting that this certain story does contain two endings ! one bad (in which it left me pretty tasteless) and one good (in which it was pretty good !) and they can be unlocked it depending on how many crystal shards have you collected (more on that later on). 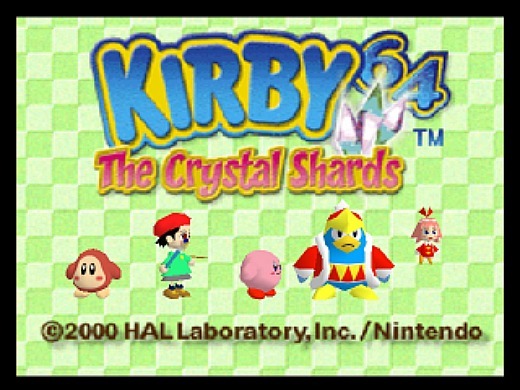 Kirby 64: The Crystal Shards (also known as "Kirby of the Stars 64" in Japan) is a 2D platformer game. You can start out with a video explaining the controls or not, but as any other kirby game, you play as him obviously, while you can jump with it, you can also flutter for a short amount of time by repeatedly pressing the A button, you can inhale some enemies by holding down the B button, and once you've inhaled someone or something, you can either press B again to spit them out, and making it hit something in front of you, or you can press down to swallow them up, but some certain enemies might have a certain power where if you swallow them up, you can gain its powers in which are called copy abilities ! in which they are fire, stone, ice, bomb, etc. but if you get hit many times, the copy ability that you are having right now will bounce out of you, that will be in a shape of a four-spiked star, and you can get it back again by swallowing it up again, you also have a health meter where you can recover by collecting the food that are spread in the game and below the health meter is a star meter where if you collect 100 stars that are also spread in the game (in which a yellow one cost 1 unit and a blue one costs 10 units) you will receive an extra life. The gameplay has the same good and enjoyable formula that many kirby games are known for, however, it also included a new mechanic in the copy abilities ! In this game, you can now combine copy abilities to turn them into one ! and you do this by pressing either the R button or any direction in the C buttons to pull out a power that you have right now and then throw it with the B button to launch it in front of you (you can also throw it upwards and get rid of it by pressing the indicated button again), and if you hit an enemy with a power, you can combine a new power in which it looks like an eight-spiked star, and then swallow it ! you can combine two different powers or power of the same kind and these combined powers can make the game easy and some of them are either just pretty useless or boring or both, they all make the game more enjoyable due to how powerful and fun they can be ! 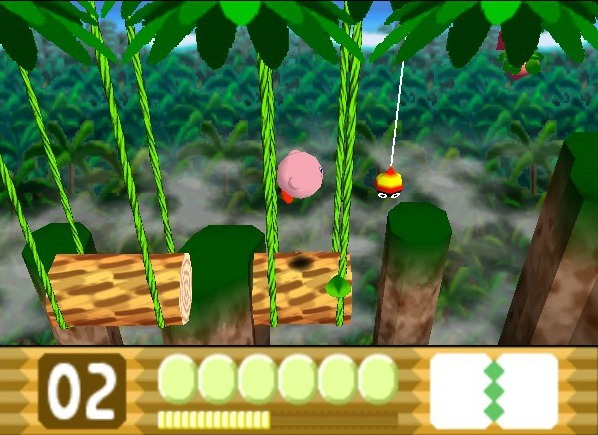 The game also includes certain moments where kirby's friends will help along the way in certain areas in certain levels, Waddle Dee can help kirby go to a next area with the help of a vehicle that he found where the game turns into an on-rails platformer where you can jump and collect items in the air and avoid obstacles, Adeleine can draw an item that can help kirby recover health, receive a powerup, etc. and finally there's King Dedede, where he can ride you and basically control him, you can attack with his hammer with the B button and you can also make it charge up by holding it, but it doesn't do anything once you let go... but you can destroy wall and attack enemies with it, but you can't flutter in the air, you just only climb any escalators in the area in order to go up, I thought that these additional gameplay elements were slow paced (with the exception of adeleine) due to how they kind of interrupt the flow of the game, but there isn't that many moments to begin with and there are also not that bad. The game also includes multiplayer, but it only supports in the minigames that this game includes additionally and it doesn't have any multiplayer in the main game, these 3 minigames are 100-Yard Hop where you race to the finish line by hopping to the stones that are in the water by pressing the A button to jump 1 space and the B button to jump 2, fall in the water or slip on an object and it will delay your race, Bumper Crop Bump where you catch many fallen fruit from the as possible and you can even make a character move out of the way by holding a direction the character's in and then pressing A, and finally there's the Checker Board Chase, where you and three opponents are on an 8 X 8 squared chess board and you must make all the blocks in front of you fall by pressing A so that an opponent in front of it must fall, each character has five lives and they lose one life if they fall, and when one opponent has lost all of its lives, the checker board becomes more tiny ! All of these minigames are pretty fun ! while I have some issues with Bumper Crop Bump's controls, I do think that the other minigames are some really fun games that you can spend with other people ! The game is fine itself, I did really enjoy the whole idea of the combining copy abilities and other things as well, but the whole thing about the crystal shard collecting could've become much better since it this game make it seem forceful and tedious to do, but for what it is, I did had some enjoyment from it. 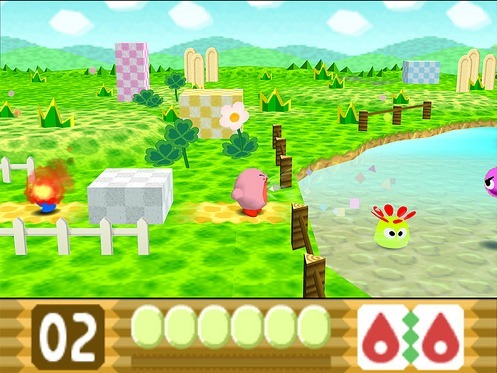 The game is designed in a 2.5D environment with a good amount of details in the backgrounds in some levels, but in a true kirby fashion, it colorful, charming and it has it's very cool (and some even disturbing !) moments in certain areas ! It looks great for its time and it does look good now, but there is an issue where I found some graphic details outdated and make it feel out of place, but there are some moments where it takes the whole environments feel more noticeable and necessary to progress on the game ! And I do appreciate how this game takes advantage of that ! The soundtrack in this game is pretty good, it can have a variety of classical scores, cool tunes and obviously kid friendly music but in a medium but still great sounding quality, there are some really good songs in there since some are catchy, some are smooth and calming, and some even are just amazing to hear, it might be even memorable to some people ! The sounds are ok, while the sounds like the kirby inhaling and fluttering have gotten a much more updated and more modern sound (during its time), there are some that lack impact and there are some that just sound more appropriate for them, thankfully the latter is much more frequent. And believe it or not, this game does have some voice acting in it ! but they are just bits and pieces of them since they consist of kirby getting hit or completing a boss level (and even dedede has one where he takes a hit !) and what they are, they do sound great and much more appropriate for the characters ! What can you expect from a kirby game ? its charm ? its cutesy nature ? this Nintendo 64 game presents at what a kirby game would be like with a game console like this by also including cutscenes that represent the story and it doesn't break the whole nature of the game's charming nature at all, in fact, it makes it better by having a really smooth and good quality that doesn't make it look cheap and not charming. The levels are also greatly made as well, since they feel more alive due to how much interaction is going on in the background and sometimes even pretty great with its pretty cool moments like in a moment where a pyramid rose up from a dessert (and all while you're playing mind you !) and imaginative and inspiring worlds, sure they might be just there for show to some people, but I do think that this game did a great job at making something different but still be charming and great that a lot of kirby games are known for. As for the replayability, there is so much to do in this game ! you can collect all of the crystal shards that are in the main game, you can also collect all of the Enemy Info Card that can be only obtained in each and single level in the game that has the picnic mode in the end (but sadly nothing happens when you collect them all...), you can unlock and replay a certain cutscene in the game in the movie theater by reaching said cutscene in the main game, you can unlock a boss rush mode by beating the game with the good ending and a sound test mode by beating the game with the bad ending, but as I've mentioned before, there are the minigames that you can unlock its higher difficulty by beating its previous difficulty. This game costs 1000 Nintendo Points in the Wii shop channel, and with the amount of time that you will be spending on this game, I think it justifys the price ! Crystal Shards was my first introduction to Kirby and still my favorite Kirby game. Combining powers was pure joy and it's a shame that wasn't carried over to newer Kirby games. Soon to be included in the Kirby: Dream Collection compilation. So if you don't own it yet, you might want to wait for that instead of downloading off VC. 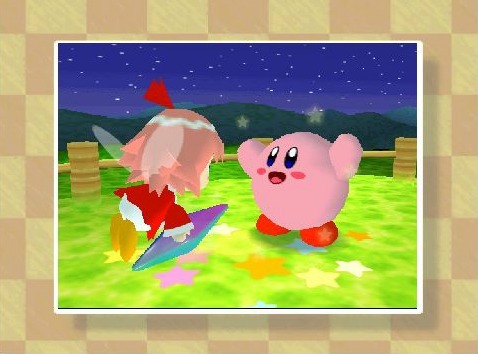 @gamerace wrote: Combining powers was pure joy and it's a shame that wasn't carried over to newer Kirby games. This is definitely one of the toughest Kirby games I've ever played. It's one of the 16 N64 games I have stored on my Wii's SD Card, and it's plenty of fun! Never played Squeak Squad. Not a DS owner. Thinking more Return to Dreamland. At some point I'll have to give Squeak Squad a go now. This is one of the most fair reviews I have seen of Kirby 64. Most sites just unfairly bash Kirby 64 because of various reasons most of which are minor opinion based problems that the reviewers blow out of proportion and unfairly affect the score they give the game. This game is an underrated gem. Anywho, great review. One of my favorite Kirby games of all time. I never understood why this game receives so much hate, but at least this reviewer understands that Kirby 64: The Crystal Shards is a great title! You know me. I'll still probably download this game, even though it hasn't been well received by critics. I gotta download F-Zero X and TLoZ: Ocarina of Time first, though. Does Kirby 64 take longer to beat than Kirby's Dreamland 3 for the Super NES? I'd say that both beating it and completing it in 100% takes longer in Kirby's dreamland 3 than in Kirby 64.